Precision Made Cartridges is a Korean-made ammunition brand that is quickly growing in popularity as gun owners discover its superb blend of low cost, high availability, and shooting consistency. 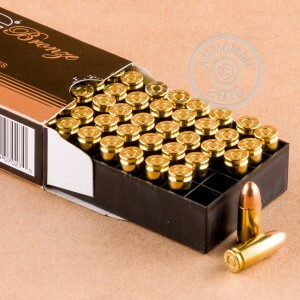 Made by a top supplier to the South Korean military, this case of 1,000 cartridges in 9mm Luger is a standard pressure load suitable for use in all 9mm Parabellum firearms including popular CCW pocket and compact guns such as the Glock 26, Sig P938, and Springfield XDs. Each cartridge uses 115 grain full metal jacket bullets, non-corrosive Boxer primers, and reloadable brass casings and passes through an electronic quality control system to ensure consistency. All orders at AmmoMan.com including this 1,000 round case ship for free, with no added charges at checkout. I swear to you, it seems to me me that as soon as you push the buy button a truck pulls up to your house with your ammo. Well if you don’t believe that can you believe the next day. I’ve witnessed this every time I order. Not to mention great ammo at a great price! Great service and order arrived quick and the price was awesome, and ammo very good. Great price, very consistent, no jams after 2000 rounds buying more now. AMMOMAN is the best! I bought this ammo for my wife who is very involved with shooting. This ammo is reliable and burns clean. 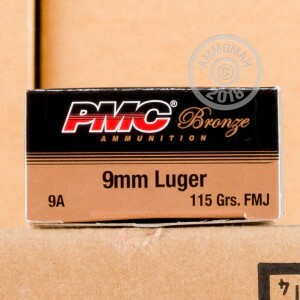 I heartily recommend PMC ammo! Good ammo. No ftf and they ran good in my guns. Shot a few hundred rounds through several different guns and they all went bang and hit the target. Couldn't ask for anything more. Recommend by a friend. Not disappointed at all. Shot 300 rounds on brand new glock 19 and got 2 malfunction. Maybe it's gun or ammo or my skill. I don't know yet what caused. Didn't have a single issue with this ammo yet . The order came a day earlier than projected.It's great ammo I've used it before & have already recommended it to friends. The price is always better at Ammoman than stores. Good stuff! No problems for me! Great price - haven't shot this batch yet but I have shot a lot of PMC and it is great ammo for the price. Fast delivery, excellent ammo. Will be buying again. No problems Shot over 2,000 rounds. No problems Shot over 2,000 rounds with a G17 and G43 not one problem! Will us this ammo again. Great price and shoots great thanks! Thank you quick shipping and a great price on brass boxer primed ammo free shipping is amazing! I'm a new shooter and this order which should have been a 5 minute task turned into an hour so I could research all the options (weight, etc). Ammo seems great, just like the more expensive stuff at the range. Very fast delivery and ammo worked like a charm! Delivery was quick and on time. I have not been able to beat the prices locally. PMC makes super reliable ammo, and I have recommended AmmoMan to family & friends. Nobody ships faster. Thank you!! Shoots good, clean and brass reloaded well. Great ammo !!! This is an excellent product that is by far the best value for your buck. It is cleaner than most and it is always dependable. And obviously Eric ships everything out ASAP. It is amazing service. I wasnt sure how the ammo would work on my guns, but found that it was great to shoot , without any problems. Good price and will order again. Happy with all aspects of the order, service, timing, ammo. Plan on ordering another 1000 rounds in a month or so. 350 rounds fired to date with Ruger 9E and M&P Shield with ZERO problems. Burns relatively clean. Delivery was very quick. I am very satisfied with Seller and ammo. Great round for target practice and compliant with my strict range. Great value, great round. Definitely getting again. Super fast delivery..........ran 50 each through S&W M&P Shield and Ruger 9E without any problems/issues. Extremely pleased with the seller and the product. what little i had a chance to shoot so far. worked very well. no ftf or fte. wish i had the chance to shoot more. but now i do have a bunch read, lol. oh and was very surprised at how heavy a case of 9mm was, when i picked it up. SHIPPING CANT GET ANY FASTER! These guys shipped the 1,000 rounds almost faster than the email that I got confirming their shipment. Their prices are great for target loads (115 grain), but what more do you need to shoot paper targets. And If you really needed the protection, this ammo would get the job done. Don't even search for better deals. These guys are awesome! Pay them and open the door 'cause the shipment will be there very fast! Great Price! FAST FAST FAST delivery. Great ammo! Even better when on sale! Never Jams. Perfect to reload the used brass cases. Accurate ammo. Clean. Small Boxes don't take up much space in range bags. I go through about 10K rounds a year of PMC 9mm and .45 ammo. I use it for practice at the range, in classes, and during competition. It works in everything I feed with it. Burns clean, feeds and extracts properly in all firearms used, no squibs or misfires. Love this ammo. feeds right no jamming.